2. In a bowl, beat eggs and add all-purpose flour, mayonnaise, salt and pepper. Mix well. 3. 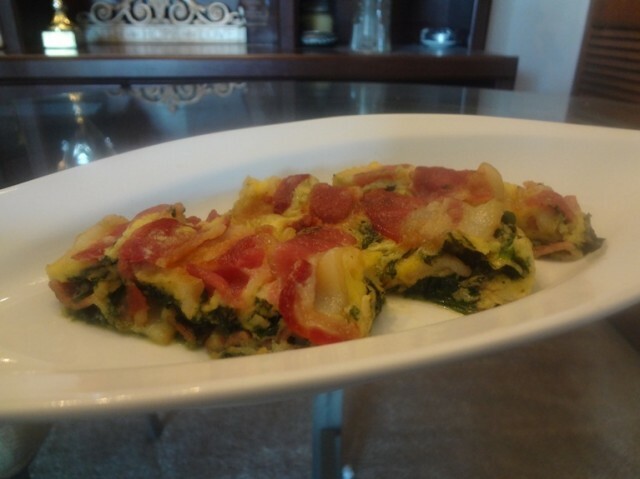 In a loaf pan (9.3”x 5.2”x 2.7”), place 1/2 of spinach, 3 slices bacon and the rest of spinach. Pour the egg mixture into the loaf pan and put the rest of 3 slices bacon on top. 4. Put the loaf pan into microwave, cook on high for 6-7 minutes (uncover) or until cook through. 5. Remove the Bacon Spinach Mille-Feuille from the loaf pan and cut into 6. Serve with ketchup or your favorite sauce, tomato sauce, pasta sauce or pizza sauce.